Your eyebrows are a very important part of the face. Need to make eyebrows and face in General looks perfect and beautiful. This is possible only when you will make an effort to improve, to make themselves distinctive and attractive. 1. In your purse have to be the eyebrow brush. With its help, you will keep them in shape. You can also use some gel when combing. 2. Don't pluck your eyebrows too often and a lot. Do this about once every eight weeks. 3. If you feel that you need to use eyebrow pencil — do it, but very gently and smoothly. You can still use eyeshadow instead of pencil. 4. The thinner the eyebrow, the more powerful she looks. Paint use only the center. If your eyebrows thicker, then apply the paint very carefully and accurately. 5. While combing the eyebrows use a little gel. This helps to seal each hair and your eyebrows will have a natural color. 6. Mascara would look great on the eyebrows. 7. If you have big brows, make them tidy, wysipad extra hairs above and beneath them. Paint your eyebrows should, as mentioned above. 8. Your face will look cute with a well done eyebrow and give something special to him (if necessary, ask the experts). 9. If you have extra hairs, they can be cut with nail-scissors. 10. Tweeze your eyebrows after showering. This will ease your task and you will not be so painful. 11. Take precaution while plucking so that you will not have openings or wounds. Refined eyebrows fit girls with nice features. If you are a sporty girl, then your eyebrows should be thicker, because for you it will be natural. - What do the girls with small eyes?! No need to use extra paint. This will make your eyes even smaller. It is better to round your eyebrows. Waxing allows you to pull the hairs directly from the root, which results in reduced growth in the future. Want to make waxing — make, but immediately after it is necessary to undergo a facial toner. Tinting of eyebrows is very common among women, especially blondes. If you've never dyed my eyebrows black, then you should choose brown or paint one or two shades darker than your hair. Before beginning the procedure it is necessary to verify the certification. Sometimes makeup makes the eyebrows even worse. 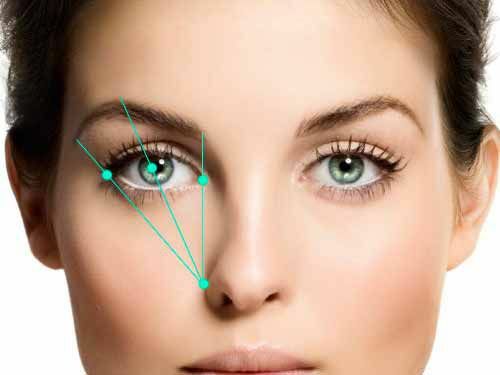 Ladies, follow the shape of your eyebrows to always look charming and attractive!